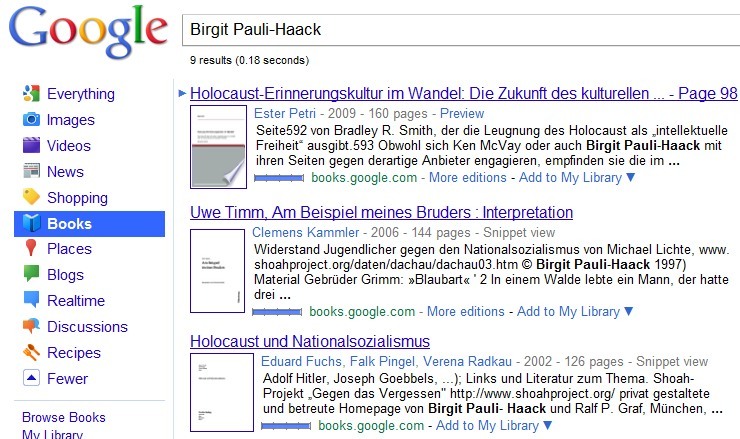 As for the Google Books Site, it has been in the news because it rubs some publishing company’s the wrong way that you can find references to their books in Internet searches. As you are not able to download whole copies but would only be able to read around the particular found section, was perceived as a threat rather a wanted add-on to the Internet search. In times when 80 to 90 % of users go and search the Internet first when they are interested in a topic having books listed as well, gives them so much exposure to the Internet surfer, an exposure publishers are obviously not eager to allow. They rather have the book sitting in their warehouses, because no one knows about them. The Authors & Books Festival, held also a great challenge as it is the first conference that was going almost all online, with the registration online, we have great data I was able to use to create the Listings, and the Google Map.